On a microwave safe plate, cook the onions in the microwave for 2-3 minutes until soft. Heat oil in a large nonstick pan over medium-heat until hot. Add onions and garlic and saute for 2 minutes. Stir in spinach and continue cooking for about 1-2 minutes until spinach is soft. Season with salt and pepper. Remove to a plate and set aside. Set aside the pan for a moment. In the meantime, break up the matzos slightly and soak in a bowl of cold water for about 1-2 minutes until soft but don’t let them get too soggy! Drain the matzos and squeeze out the water. Combine the matzo in a bowl with eggs and egg whites. In the same pan, melt the Smart Balance over medium-high heat. Add the matzo/egg mixture, cooked onions and spinach and scramble, stirring constantly until eggs are cooked. Divide among 4 plates. Sprinkle each plate with feta cheese and serve immediately. Let everyone season their own with salt and pepper to taste. Matzo Brei [MAHT-suh bri] is one of the great traditional breakfast or brunch treats. Look on the menu of any Jewish delicatessen and you’ll see this popular dish. Normally made by soaking matzo until soft, frying with eggs and serving with applesauce, cinnamon-sugar or jam on the side, we’re shaking things up a bit! 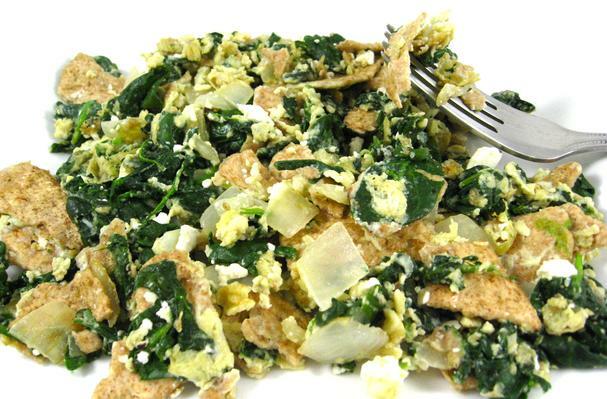 Our savory skinny recipe sautes fresh spinach, garlic and onions first, then scrambling with matzo and eggs. It turns ordinary Matzo Brei into a really fabulous, healthy meal.